Great quote. 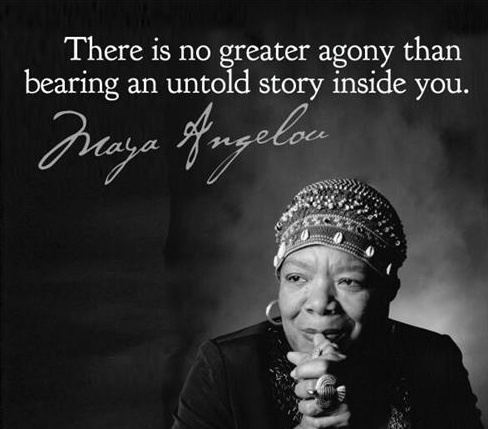 Maya Angelo has been quite an inspiration to many people. Few minutes ago I created blog here about my mental health problems. I will share my story trough posts because nothing is so black and white (at least not with me), and everything need to be written to a single detail. I would like for you to come to my page, read a little and maybe you will find some stuff interesting. I come from one small country so stigma is a big part of being mentaly sick. People like to put labels on you and if they label you “crazy” – you will never be able to remove that sticker. I will write about that too. I think my story is so usual and at the same time different and that it is worth telling. I would like to send you an email and answert all of possible question you may have. Wow Ameena, I welcome Mental Health Fridays! It is time that we as a society destigmatize mental health problems. Thank you very much. I believe it is about time we talk about it, not try and end the stigma attached to it. Suffering from mental illness doesn’t make us any less humans, I hope people get to see that. That’s a great initiative, which can bring all of us closer. And, maybe somebody could have a solution too ! Do you happen to know anyone who’d like to share a story? BRAVO!! This NEEDS to happen! I applaud you. Much respect! Oh thank you very much. I appreciate it. Just came across your blog and glad to have. Such a thoughtful idea. I whole heartedly appreciate it. Thumbs up!! Happy to hear that you have joined the ranks of mental health awareness. I blog about mental health awareness on my blog, Susan’s Blog: The Inner Soul at http://susansblogtheinnersoul.com. I’ll email you, Ameena. Then I’ll decide if participating is best for me. This is a wonderful educational idea and outreach. When I first read this there weren’t any postings. I see there are some now 🙂 So a start, right? Haha, yeah baby steps. And thank you. I’m glad you are doing this. This is a good post . It is very important to speak up the hidden words and let them go .. this is the simplest mantra to avoid mental illness.. Thank you very much. Speaking is truly important, I’m glad you agree. Hi hun, I nominated you for the Blogger Recognition Award, if you would like to participate, here is the link https://breakdownchick.wordpress.com/2018/02/09/the-blogger-recognition-award/,, thank you for all you bring to the blogosphere! This is an amazing advocacy! I salute you, Ameena! May the voices let their heart and mind sounds be heard. P.S. That quote is the words that pushed me to start my blog. 🙂 Amazing! Me too! She is one amazing woman! firstly the quote is superb. touched me. and your initiative of mental health advocacy is really great work. keep up your good work. all the very best. This quote by Maya Angelou is one of my all-time favourites!